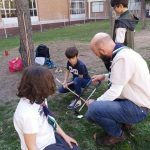 For this month activity, all the sections but Beavers met together at the Headquarters located at the St George’s School. 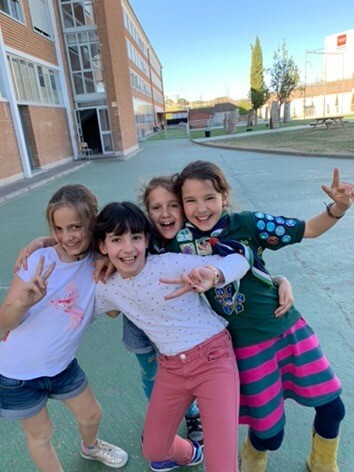 The small ones went to Baldebebas, having great fun at the park Felipe VI. We started the meeting with a uniform inspection to check badges, neckers and overall uniform neatness. Badges and certificates were given to each Sixer who is the head of a Cub Pack (Sixes). We revised the Code of Conduct and decided on a Sin Bin for those behaviors that are not in line with the Code. Since we have a few newcomers that have only attended a few meetings we played an ice breaking game. The game is called Elves and Wizards and it was helpful in bonding the group together while bringing lots of laughter. For the Artistic Activity Badge we decorated a paper bag which will be used as a surprise bag in the spring fling. Each individual Cub expressed on her/his bag a unique style. We saw bags with drawings of starry nights, smiley faces, horses and some were brave enough to make abstract decorations. Interesting how Art can quieten a group and bring forth unique talents. After a healthy snack we presented the game everyone was waiting for. 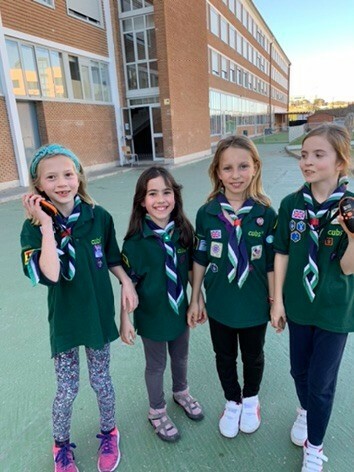 Since the very beginning of the meeting a few of the Cubs noticed that we were carrying Walkie Talkies, so once we announced the game, they were all very excited. 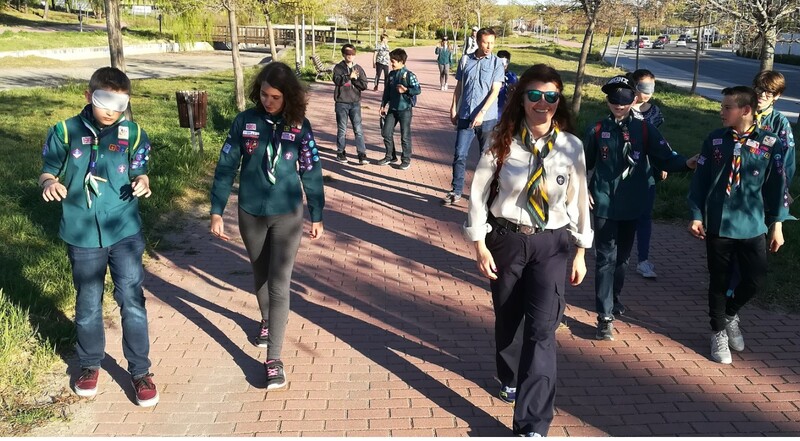 Although we were going to give some explanation on how to use them, we soon noticed explanations were not needed, in a short time they created teams and were walkie-talking to one another. We created teams of Sixes and each group had to compete with each other in order to resolve a riddle. On different points of the School field there were papers with letters written on them. 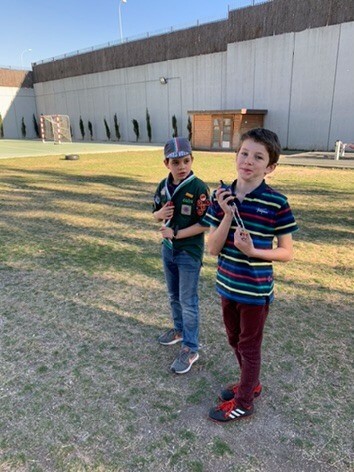 Each group had to send members to the different areas and then through Walkie Talkie transmission combine the letters in order to find the hidden word. 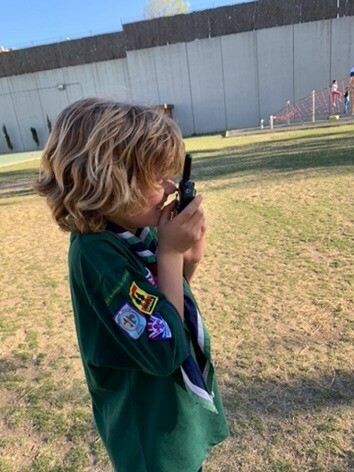 It was a lot of fun, and in times when “mobile screen time” is taking the upper hand, is interesting how simple Walkie Talkies can bring great fun in a simple manner. 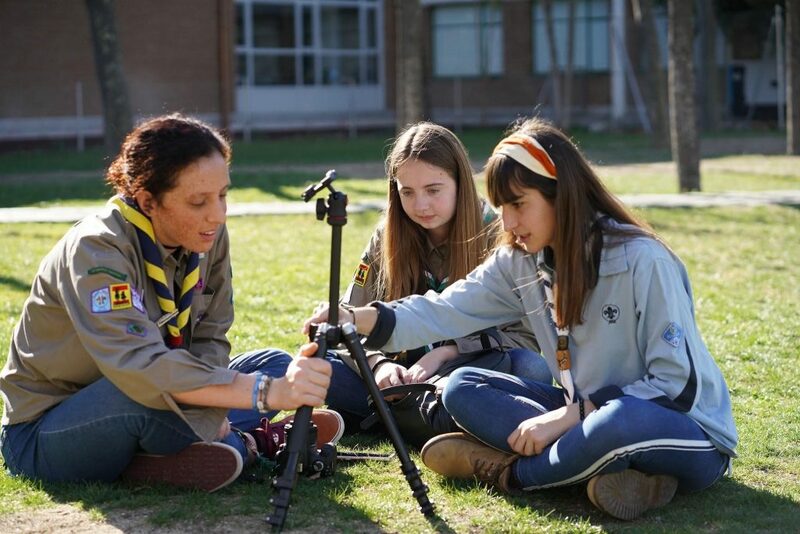 The Explorers help us setting up a video both for all the Scouts that participated in the London Monopoly trip. They could come one by one and tell the camera about their experience and thoughts about the Monopoly event. 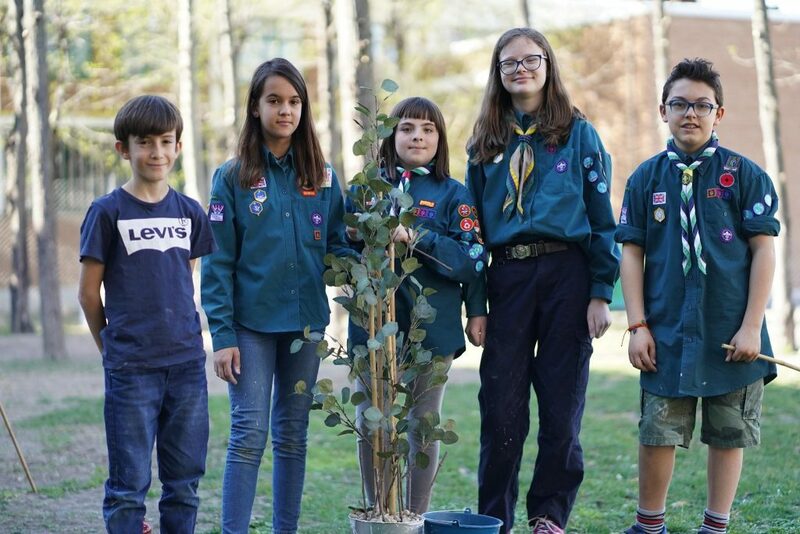 In the spirit of the wise words from Winnie the Pooh, the scouts were building a tree, and we are a calling it a reflection tree. Each patrol was building one. And it will remain in the patrol for the rest of the year. They will bring it to each meeting and camp. And after each meeting or during they can hang up small notes with thoughts and reflections. We will then collect all these as a memory of the year and perhaps have a discussion about some of them. 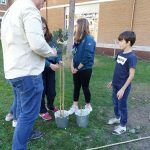 We were using some bamboo sticks as the trunk of the tree and fake leafs as branches. The Bamboo was mounted into a flower pot filled with plaster. 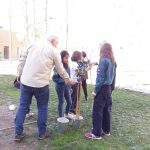 Everybody was helping and in the end they made a fantastic tree. After the trees were finished we had a snack break before we started our next Activity. We were learning about different disabilities. Helping each other and work as a team we were going to set up a tent. 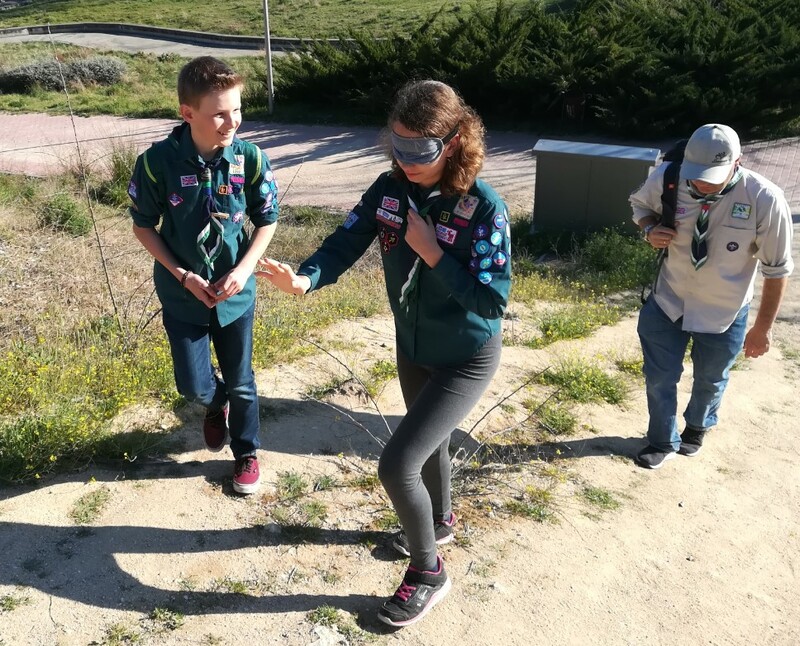 Again the scouts were working in patrols and three of the scouts in each patrol pretended to have some disability like visual impairments, only one functional arm and one in wheelchair. The Scouts were working very well together and helped giving instructions to the scouts with pretended disabilities. 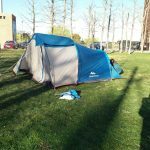 They even managed to mend one of the tents that had a broken pole, very patiently they were adding a new elastic line through the pole. 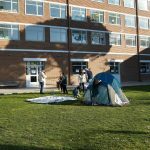 Both patrols did a very good job putting those tents up, working together and helping the ones that needed help. 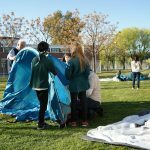 Once the tents were up the Scouts could enjoy them for a little bit before it was time to take them down again and pack them properly in their bags. The wrap up and conclusions was done before closing ceremony. 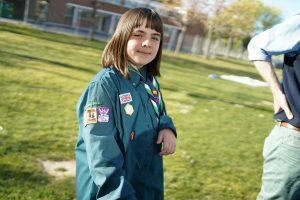 Some of us may know people who have disabilities or have experienced first hand what it is like to lose an ability for a period. Many of us, however, don’t have that understanding. 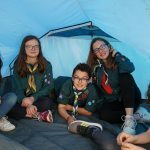 Our March meeting was designed to give the scouts a better understanding of what living with a disability is like. 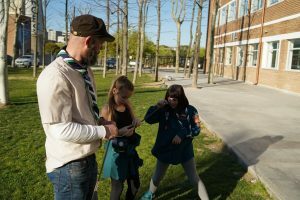 The scouts first wrote their name with their nondominant hand followed by a longer text. Then we talked about the experience, noticing that writing actually became easier the more text was written. 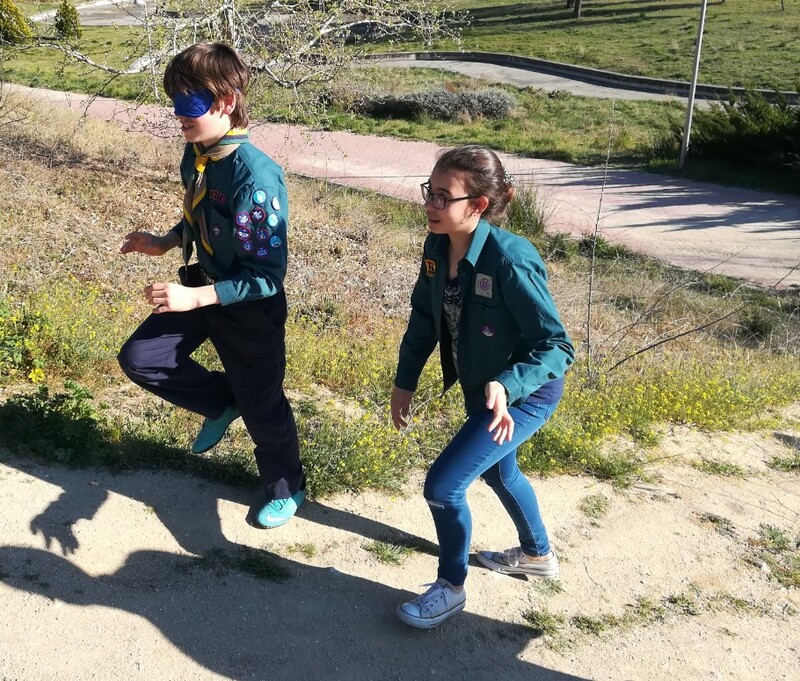 Then the scouts put on blindfolds to gain a better understanding of the world of the visually impaired. 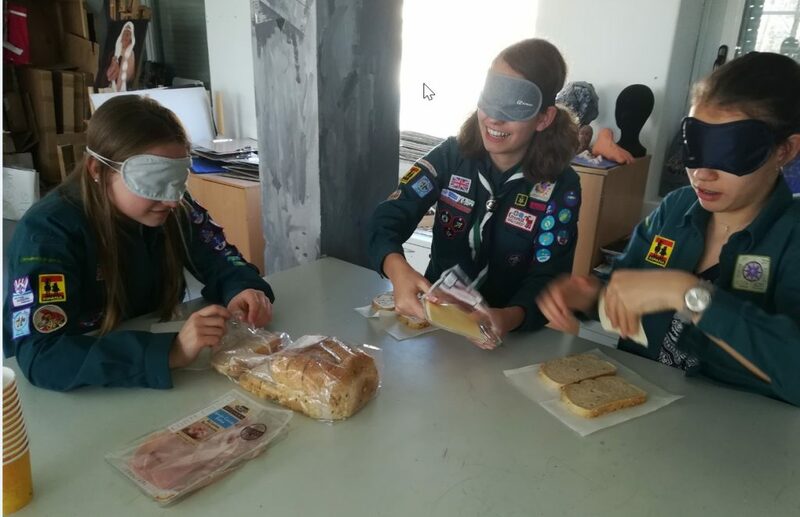 In the first activity, the scouts had to make themselves a sandwich, and fill a glass of water. 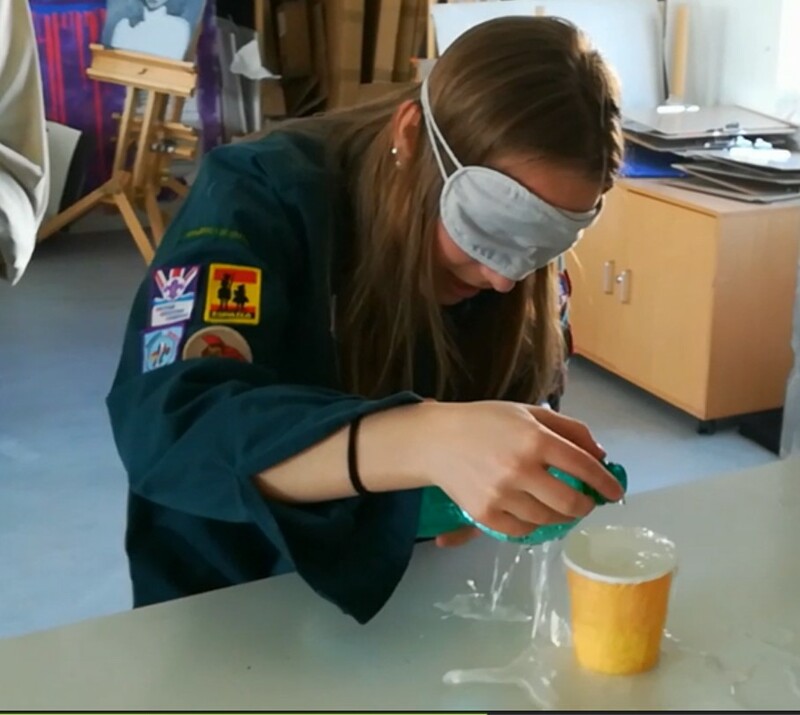 Even though making the sandwich seemed not to be that difficult in the end, filling a cup of water and try to hear when the cup was full and stop at the right moment, turned out not to be that easy. 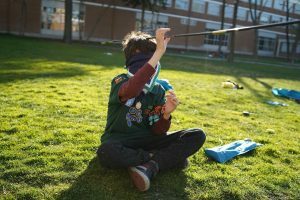 The scouts quickly realized they should rely on other senses, primarily touch and hearing, to compensate for the lack of sight. 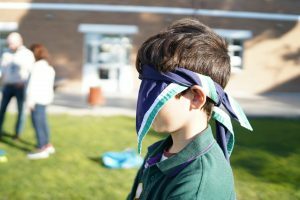 (Although some did peek under their blindfolds sometimes, demonstrating how challenging this can be). After making and eating the sandwich (and cleaning up), we went for a walk to the park in couples. One person would go blindfolded while the partner would be guiding. 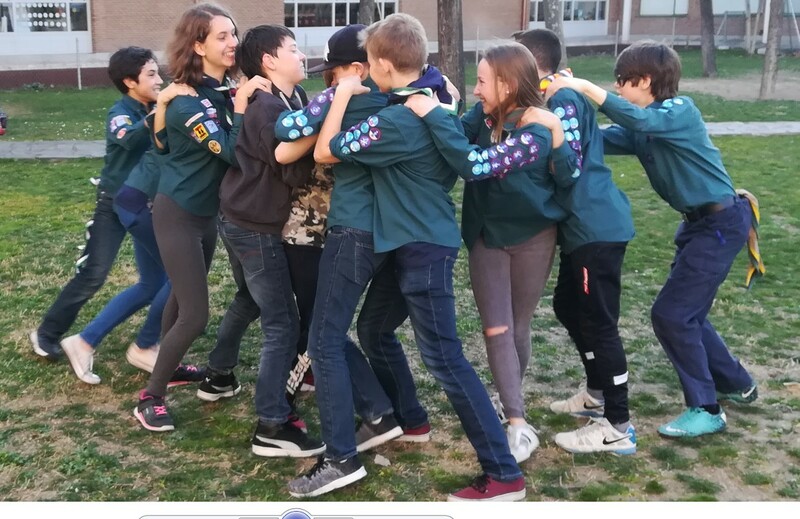 This also was clearly a trust building exercise, the scouts were mixed up so they weren’t necessarily counting on the person in the troop they already know best. Once in the park we took a quick moment without blindfolds to explain how to orientate using the sun with some precision in case your compass is missing or broken. We will practice this skill in following meetings. 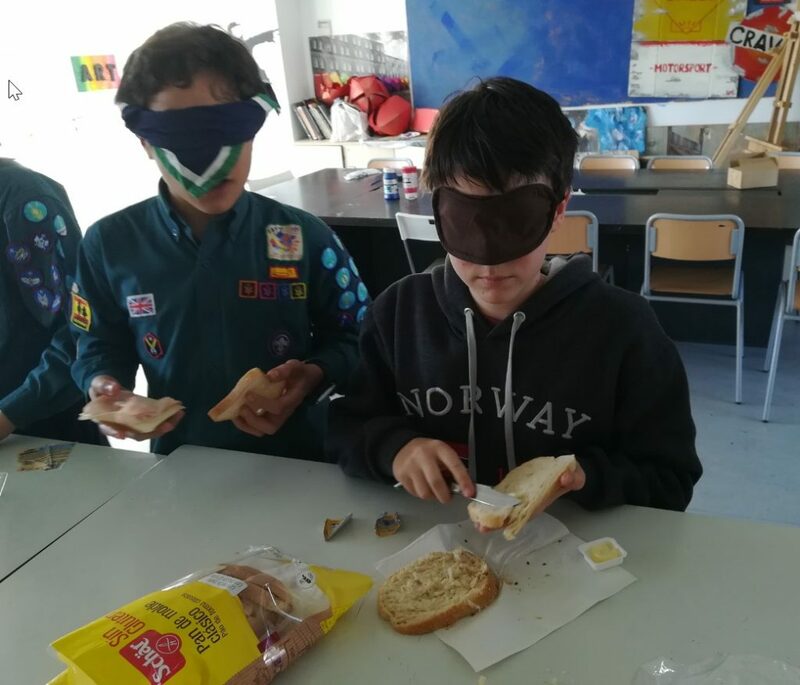 Finally, it was the time to play some games, but with the blindfolds and to practice using other senses. In the first game everyone had to try to follow different sounds. 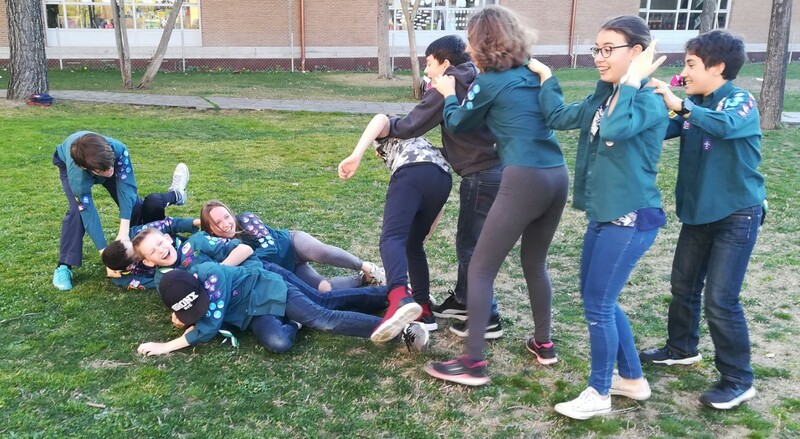 Another game was the “blind worm.” In this game the scouts form two “worms” with only the last scout able to see. This last person leads the group using touch code on the shoulders passed on from person to person to the front of the worm. The first worm to reach a certain point won the game. 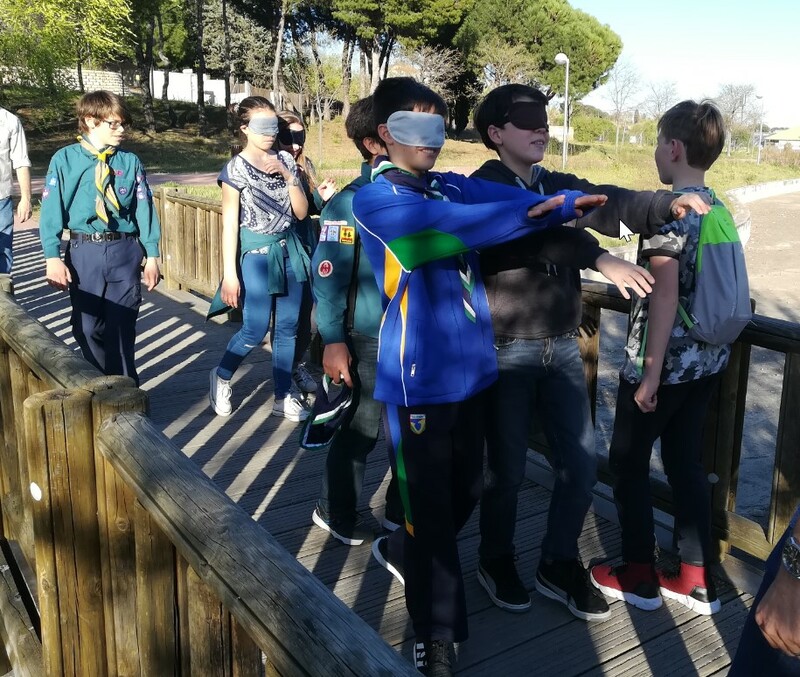 After the games, we walked back to the school following a different path, switching our pairs of guides and visually impaired. Once back, we used the last minutes to play “the tail of the dragon” where lining up in two teams (2 dragons), each dragon had to take the tail of the other dragon (Scarf in the last person’s back) before the other team did.